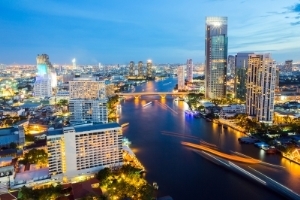 Earlier this month, the Thailand Public Health Minister, Mr. Pradit Sinthawanarong proposed at a meeting in Bangkok a scheme that would require the purchase of travel and health insurance for tourists to Thailand as well as those traveling on visas. This move is intended to improve the availability of healthcare for those traveling in the country while at the same time relieving some of the burden on state hospitals that provide emergency medical care for foreigners. The initiative is currently at the proposal stage and there remain several details to agree upon before implementation. Details such as long waiting lines at incoming immigration checkpoints as well as opposition from airlines are among some of the issues to find solutions for. One idea presented is adding the cost of travel and health insurance to airline tickets and visa fees. Since Thailand allows 30 days entry without a visa, there may also be kiosks set up to purchase the coverage at immigration checkpoints. Currently, a foreigners traveling in Thailand can receive free healthcare at state hospitals in emergency situations. In certain instances, a foreigner might receive healthcare services and then claim an inability to pay for which Thai hospitals have no way to recover the loss. While Thailand is safe, has modern medical care, and implements health standards in its food products and other consumables, accidents and sicknesses among foreign visitors are still a risk. It is not uncommon for tourists to get sick from street food or have a mishap while at the beach. Thailand also has motorcycle taxis which are convenient for getting through heavy traffic but risky. Foreign travelers have been known to use these conveyances and suffer injuries from falls. Thailand is known for its affordable healthcare facilities and many in the country do not need insurance and can pay cash. It is also for this reason that medical tourism continues to be popular in the country. However, rise in uninsured tourists and the risk of mishaps threatens to increase those costs which have been held low in the past. Posted by News on Jul 16 2013. Filed under Featured, New, Travel. You can follow any responses to this entry through the RSS 2.0. Both comments and pings are currently closed.